Feeding fruits and vegetables for dogs is a great way to supplement and treat without adding too many calories. Sharing nutritious treats with your dog is another way to help you both stay healthy, not to mention the deeper bond it creates. However, what vegetables should you be feeding and in what kind of quantities? Are there any that you shouldn’t feed? Dog foods should be complete and balanced for a dog's nutrition, so technically you don't need to add additional nutrients. That assumes that your dog is in perfect health and getting all the nutrients he needs. This is a statement you hear over and over again from the major dog food manufacturing companies and repeated over and over again. Does your dog need this extra nutrition? That may depend on the type of food you are serving, his lifestyle, and his general health. A high quality food will provide all the needed vitamins and minerals in the correct quantities. A dog is more of a carnivore and as such won't require much in the way of plant based nutrition. By that, I mean that they are not pure carnivores but are not omnivores or herbivores either. To understand the nutritional needs of the dog, you need to look back into history. Dogs have descended from the early ancestors of wolves. They survived by being scavengers. Even wild canines will eat the entire carcass of an herbivore including the stomach contents which includes plant material. Wild dogs, wolves and dingoes will also scavenge for fruits and vegetables. Vegetables provide proteins, fats, carbohydrates, phytonutrients and fiber for a dog, but as nutritious as that sounds, dogs are not herbivores and as such do not do well on an all vegetable diet. But, there is good reason to give some vegetable/ plant based foods. Vegetables (and Fruits) are an excellent source of water, especially needed if you are uncertain your dog is drinking enough water. Vegetables provide a rich source of fiber, needed for proper digestion. Julia Henriques, from Dog's Naturally Magazine, writes about the need for vegetables as aids in treatment of degenerative diseases such as diabetes, kidney, liver, IBD, cancer and arthritis. Since dogs can't talk we have to deduce their needs based on their body language and the way they act. Sometimes, we just get it wrong. Can you tell when your dog has an upset stomach if she isn't vomiting or having diarrhea? Can you tell if something hurts if she doesn't cry, limp or show other outward signs of pain? While we may know our dog well and worry about their health, do we really need anything else other than dog food? Most dog owners will provide additional treats to their dog. When training for the first time, training treats are often used as a motivator. Rather than purchasing ready made treats, tiny bits of carrots and apples can be used instead of manufactured treats that are questionable in quality and safety. Let's face it people who are very concerned about their dog's nutrition may forget to look on the labels of pet treats. Many treats come from questionable sources, contain questionable ingredients, and may have no nutritional value at all. We’ve also put together a list of foods dogs should not eat. 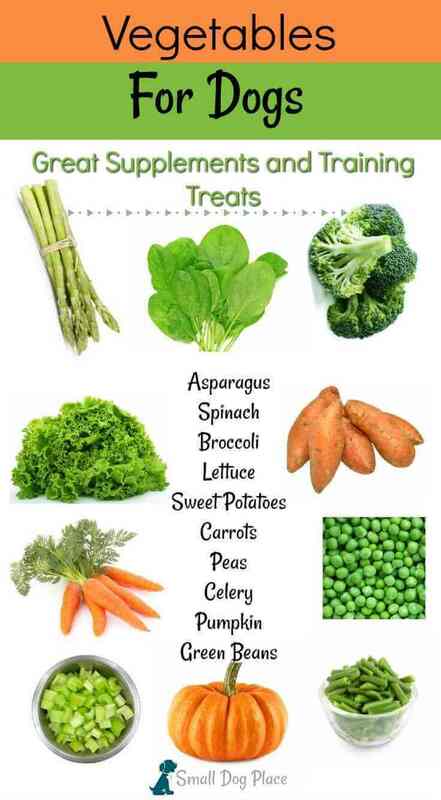 Do check that out as not all vegetables are healthy and safe for dogs. You’ll also find the calorie content of these foods and a way to decide how to incorporate them into your fur friend’s daily diet. Remember, this is not an exhaustive list of vegetables for dogs, just a list of the ones that provide the best nutritional bang for your buck. You should be fairly safe in experimenting with new vegetables for your little dog as long as you make sure you steer clear of those foods toxic to dogs. Remember that dogs do not have the same nutritional requirements as people, so you don't need to include any fruits or vegetables for dogs in large quantities. You can see how many calories each contains at the bottom of this page. Here's our list of 20 vegetables dogs can enjoy. Two great things about Asparagus is its low calorie count and impressive nutrients. Asparagus contains vitamins including A, B1, B2, C, E, and K. You’ll find an even more notable list of minerals, including folate, iron, copper, fiber, manganese and potassium. The nice thing about vegetable preparation for a dog can be exactly the same for a person. Asparagus can be steamed, grilled, sauteed, or blanched. The first asparagus of the season comes in think tender stalks but later on the asparagus stalks can become thick and hard. Before choosing a cooking method, cut off the hard woody part of the thicker stalks. Broccoli is one of those super foods loaded with nutrients. 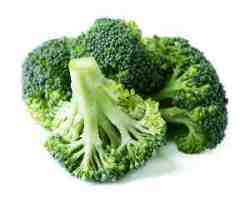 Broccoli contains vitamins A, C, D, beta carotene, folic acid, as well as fiber, calcium, and chromium. When you cook broccoli, cancer fighting enzymes are released. Broccoli also contains several phytochemicals, substances that halt carcinogens in their tracts, breakdown carcinogens, and prevent them from attacking normal cells. If all those benefits were not enough, Broccoli contains sulforphane, a substance that improves immune functions. Although broccoli seems like the perfect food, feed this one in moderation. Too much can reduce his thyroid functioning. The recommended daily consumption is not to exceed 10% of his total daily food intake. Puppies should not eat broccoli as their GI tract is not mature and even a small amount may cause upset. 1/4 cup = about 15 calories Not to exceed 10% of the total daily food intake. One or two small florets or small sections of stems may be all your small dog can handle. If your dog is not fond of raw broccoli florets, you can steam until soft but not mushy. Dogs do better with cooked vegetables than raw ones because of the way their GI tract is constructed. Dog were never meant to eat raw fibrous plants. Furthermore, dogs tend to gulp and swallow their food rather than chew it up. It is best not to season any vegetables intended for your dog. Microwave broccoli in a small amount of water. Chop up in small pieces before serving. No need to add salt, seasonings, butter or oil. Vegetables for Dogs: Brussel Sprouts? Maybe Brussel Sprouts are not your favorite vegetable, but if you like them, why not share a sprout with your small dog. Brussel Sprouts contain vitamins A, B1, B6, K, and G and also have manganese, folate, and potassium. Vitamin K helps clot blood, build burns, and can protect the heart. They are a good source of fiber for both you and your dog. 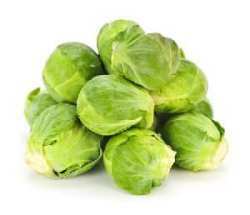 The antioxidant properties found in brussel sprouts improves blood circulation. Brussel sprouts are also known to have compounds that fight against free radicals. So as you can see this vegetable is very healthy especially for you. There are no toxins in the vegetable according to Jan Reisen from the American Kennel Club, but there is a downside. Gas. Too much of a good thing can cause stomach upset and diarrhea and the accompanying flatulence. As with all of the other vegetables on this page, moderation is encouraged. If preparing brussel sprouts for you and your dog, the simplest method is to steam or microwave using no added salt or seasonings. After removing your dog's small treat, you can then add the seasonings that you like. Grilling and baking have become popular ways of cooking brussel sprouts and as long as you don't add items such as onions that might hurt your dog, you should be fine. Spray a cookie sheet with olive oil. Wash and remove the stems. Cut brussel sprouts in half and bake or grill until slightly blackened. Over cooking will robe all the good vitamins and benefits of the food. Carrots are a favorite among dogs and contain vitamins A, C and K.
They are also a source of vitamins D, E, and K. They are also high in beta carotene, potassium, and fiber. 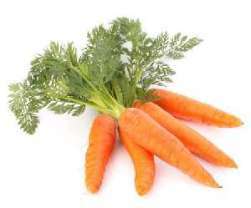 Carrots are good for your dog’s vision as well as his skin and for cleaning teeth and gums. Other minerals found in carrots include riboflavin, niacin, calcium, , phosphorous, sodium, magnesium, and iron. These important vitamins and nutrients support the immune system and digestion. This is one vegetable where it is safe to serve raw and in fact, raw, frozen carrots make great teething toys for puppies and adults love to chew them too. If you use carrots as a training treat, chop them up into tiny pieces a the dog is like to spend some time chewing and this may detract from the training session. Dogs can also eat carrots that have been cooked. Boiled, Steamed, blanched or prepared in the microwave are all very easy ways to cook carrots. Add seasonings to your taste after you remove the unseasoned portion for your dog. 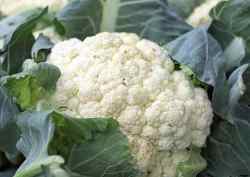 People love raw cauliflower, but dogs may not do well munching on a raw floret. Most dogs tend to eat too fast, and the vegetable could get stuck in his throat. It is better to cooking them before serving. The cauliflower floret as well as the leaves are edible but don't eat the stems. Boiled, steamed, roasted, baked or grill for you and your dog. Cut up the florets into small pieces to avoid a choking hazard. Some people prefer to add milk when cooking cauliflower. If you plan to share with your dog, this is not recommended. Celery is as a resource for improving heart health and reducing cancer rates. It is a great source of calcium, potassium, phosphorous, sodium, iron, and vitamins A, B and C.
It contains the phytochemical 3-n-butyl phthalide that has been found to reduce the rate of tumors in lab animals, reduce blood pressure great for improving heart health and can reduce the rate of cancer according to the BARF Diet. 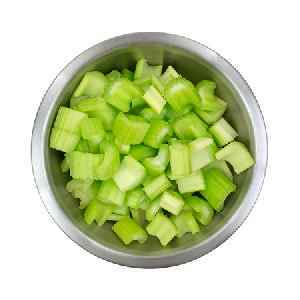 Celery also reduces nervousness and acts as an acid neutralizer in animals. Best of all, in my opinion, celery freshens doggie breath! Stalks are fine, but remove the leaves before serving. If you plan to serve raw, chop up in tiny pieces so your dog will not choke. You can also boil or cook celery and add to a beef or chicken stock to make a soup. 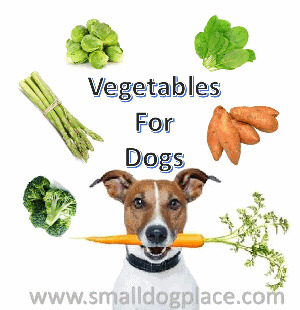 Add other vegetables and serve a warm soup to yourself and your dog. Remember, dogs can't eat onions so please do not add those to your homemade broth. 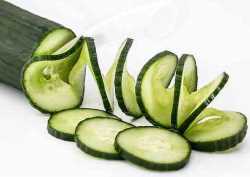 What better summertime treat can one find than a cool cucumber that contains almost 96% water. Dogs love these vegetables too. But just as with all vegetable treats for dogs, moderation is important. Too much of a good thing can cause stomach upset and even diarrhea, so don't share too many of your cucumbers with your dog. 1 sliced (peeled) = 1 cal. Peel, slice and cut into four pieces for small dogs. 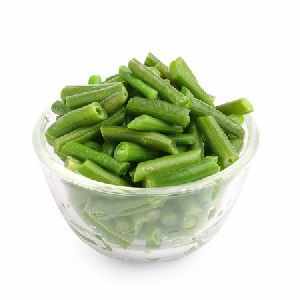 Green beans are a source of omega-3 fatty acids and vitamins A, C, and K. They are also a source of a whole slue of minerals. The minerals found in green beans include calcium, niacin, potassium, iron, copper, fiber, folic acid, iron, manganese, riboflavin, and thiamin. Vitamin K helps maintain bone health. Omega-3 fatty acids aid in heart health. Green beans also contain beta carotene. This sounds like a winner food for both you and your dog. Dogs can eat raw ripe green beans in moderation. Wash the vegetable and check for ripeness by snapping one in half. If you hear that snap sound, you know it is fresh. Boiling, steaming microwaving are also fine ways to prepare green beans for yourself and your dog. Salad anyone? I was fairly surprised that my dogs love to eat salad. 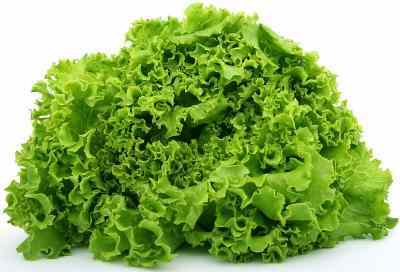 The more green leafy vegetables the better and most of my salads contain lettuce which is often scarfed down. Lettuce is a good source of Vitamin K and A. The provitamin A, beta-carotene is also found in the dark green lettuces such as Romaine. Darker varieties of lettuce provide folate and iron. Do be careful with the fat soluble vitamins, (A, D, E and K). Unlike water-soluble vitamins that will be excreted from the body if taken in excess, fat soluble vitamins will be retained and stored with fat in the body. There is no preparation other than to wash the leaves and cut into small pieces as you would do when preparing a salad. Peas are loaded with healthy vitamins and minerals which is why we may have been told as children to eat our peas. Dogs tend to love the taste and can tolerate peas cooked, frozen or thawed (uncooked). 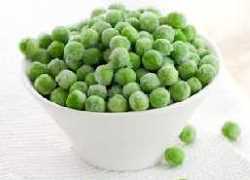 Peas contain vitamins A, B1, B2, B3, B6, C and K. They also contain thiamin, phosphorus, manganese, fiber, and folate. Dog food manufacturers will often include peas in their ingredients because they are a natural source of protein. Peas can be boiled, steamed or added to other ingredients for a hearty stew or casserole. You can also give your dog frozen peas, which makes a great summertime treat. Potatoes are often found in dog foods that are considered grain-free because it offers a decent source o starch and fiber. Dogs can share your potatoes, but should not eat them raw. This tuber is rich in B6 and contains calcium, phosphorus, magnesium, and potassium. Do not eat or give the leaves, flowers, sprouts, because they are poisonous. Potatoes have do not have that many calories, but it is how they are prepared and what we add to them that can make them calorie dense. 110 calories per average size potato (a tsp. or small bite of potatoes is all that a small dog needs as a treat. 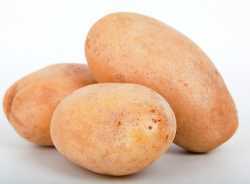 There are numerous ways to prepare potatoes: Boiled, Baked, Microwaved, Fried, Sauteed, or mixed with other ingredients to make potato salad, scalloped potatoes, made into potato chips or added to soups and casseroles. Pumpkin (not the canned pumpkin pie variety) Provides a rich source of fiber, which is important to digestive health. It also contains vitamin A and and has a good amount of potassium which regulates blood pressure. Pumpkin also contains small amounts of Vitamin C, Iron, Phosphorus, Magnesium and Folate. So if your dog is suffering from constipation or diarrhea, heap on a spoonful of canned pumpkin to his regular diet. Pumpkin also promotes overall cardiovascular health. Dogs can eat the seeds, but they need to be crushed and turned into a powder. Raw pumpkin is edible but not very tasty to people or dogs. Canned pumpkin straight out of the can is the easiest way to provide this treat. 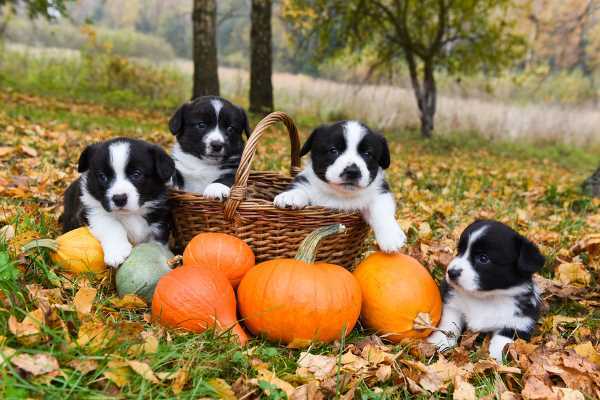 A ten pound dog can have 1 tsp of canned or fresh pumpkin per day. One seed per 10 pounds of dog can also be offered. You can also prepare fresh pumpkin in the oven. Poke with a knife or fork and bake in the oven for 45 to 60 minutes at 350 degrees F. Remove and peel. Serve chunks or puree. Spinach is a super food for both you and your dog. It helps protect against inflammation and heart issues, as well as cancer. It is high in iron. You can offer spinach to your dog cooked or raw depending on preferences. 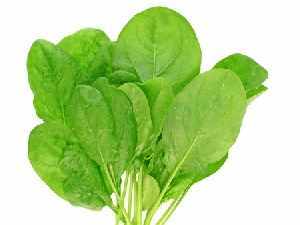 Spinach can be eaten raw or cooked and added to a variety of different dishes. Fresh spinach can be sauteed in a little olive oil for about 5 minutes. Remove your dog's portion before adding other ingredients such as garlic salt, cheese, onion powder, lemon zest, etc. You can also boil, bake or steam. You can also use frozen spinach, cook and add a light cream sauce. If you are serving it like this, remove your dog's portion before adding any garlic, onion or pepper. 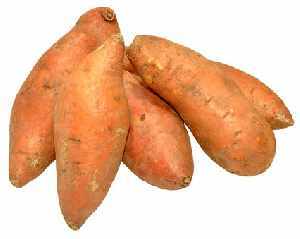 Vegetables for Dogs: Sweet Potatoes? No need to cook up an extra sweet potato for your small dog, just share a few bites of yours with him. They have A, B-6, C and E and are loaded with minerals as well. Sweet potatoes contain iron, potassium, copper, calcium, folate, thiamin, and folate. Most dogs love the naturally sweet taste but as with any of these selections, you can overdo a good thing. Never serve sweet potatoes raw. Sweet Potatoes can be baked, roasted, mashed, grilled, or deep fried and turned int sweet potato chips. For dogs, it is advised to bake or roast and set aside his portion before you add any seasonings to yours. The fresh, red fruit of the plant, a summertime treat, is fine for dogs to eat. Yes, you read that correctly. 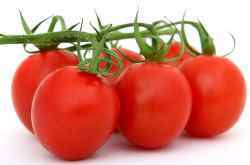 Tomatoes are technically a fruit, but most of us think of them and treat them as vegetables. They offer a good source of Vitamin C, A and K1, and contain potassium and manganese. The biggest problem with tomatoes is the green plant that the fruit grows on and this includes the stem, leaves and unripe green tomatoes. They contain a toxic substance called solanine, that can cause GI upset, cardiac and nervous system distress (tremors, muscle weakness and seizures). Luckily, the mature fruit contains little of the substance, as long as the tomato is ripe, it is fine to eat. If you love growing your own tomatoes, find a safe place to store potted plants or keep your dog out of your growing garden. Sharing a bite of your salad tomato is fine, but if you plan to cook tomatoes to put into other dishes, beware that dogs can't eat the garlic and onion that often accompanies meals made with tomatoes. These root vegetables are a healthy choice for both you and your dog. They contain Vitamins B6 and C. They also have antioxidants that can help fight cancer and have anti-inflammatory and anti-fungal properties, as well. All three of these vegetables are a great source of fiber needed for a healthy GI Tract. They also contain potassium and folic acid. Since they are low in calories they also make a good choice for a treat. 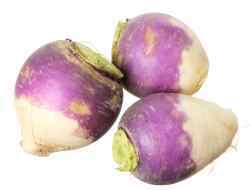 They are a source of calcium and folate and, best of all, they are low in calories (17 C/small turnip). This doesn't mean that your dog should eat a large quantity. A good rule of thumb is to keep vegetable (and fruit) consumption to under 10% of the total daily calories per day. Turnips can be a great treat for your dog. Serve them dehydrated, baked, mashed, or raw. Dogs can eat these vegetables raw, but they may pose a choking risk. Dogs tend to gulp or swallow their food with little chewing which can be a problem in many of these harder vegetables. Cook, boil, or steam. You can also mash them with another vegetable such as potatoes for a delicious side for you and a taste treat for your dog. 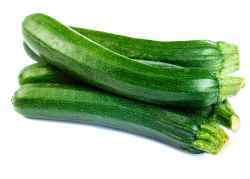 Zucchini is fine for dogs to eat and offers few calories if your dog is watching his waistline. It is a very healthy vegetable for both you and your dog and is packed with Vitamin C and B6, Manganese, Potassium and Folate. They can be eaten raw or cooked and because they are slightly sweet in taste, dogs tend to love them. Be aware of the way you prepare your zucchini. Dogs should not be able to eat zucchini bread that contains xylitol as this sweetener is toxic to dogs. If you love your zucchini in a rich buttery, onion, garlic sauce, set aside a few cooked pieces before adding in those extra ingredients. Dogs should not eat onions. Serve raw or boil, bake, microwave, or steamed. Dogs will eat the zucchini plain with no additional spices or ingredients. This list includes fruits and vegetables that you should not give to your dog. A more comprehensive list of foods toxic to dogs can be found here. Always core apples before giving the fleshy part to your dogs. Don't feed seeds. Many dogs love raw carrots, but if yours does not, steam or boil them slightly. Always remove seeds from fruit before giving them to your dog. Keep treats down to about 10% of your dog’s total daily food intake. You can offer vegetables raw (unless otherwise noted), slightly steamed, boiled, or baked; sliced, diced or pureed. 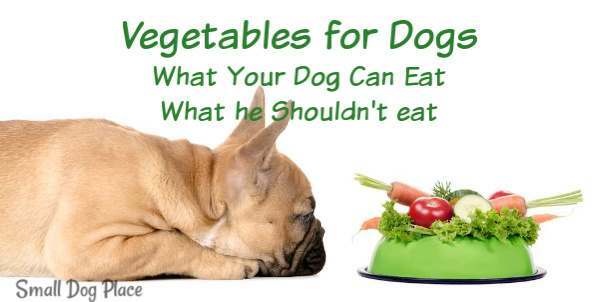 Think your dog would benefit from vegetables or fruit, but they won’t give them a try? Try a spoonful of vegetable baby food mixed with his regular food. Watch your dog’s stools after giving vegetables. If diarrhea develops or he appears to defecate more frequently and in larger quantities, reduce the amount of vegetables you are providing. The average small 10 pound dog needs less than 375 calories per day. (More for pregnant and lactating females and less for weigh loss) Very active dogs will need additional calories. Check your dog’s food package to determine how many calories he is getting from his normal food. Adjust any of these fruits and vegetables for dogs snacks accordingly. More information on calculating caloric intake. Do you know what you're feeding your small dog. 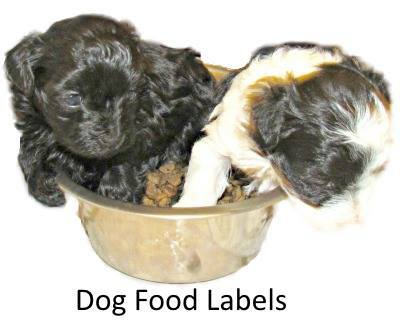 Learn to read Dog Food Labels to be an informed consumer. There's more than meets the eye..
A savvy small dog parent should know what their fur baby needs for optimal health. 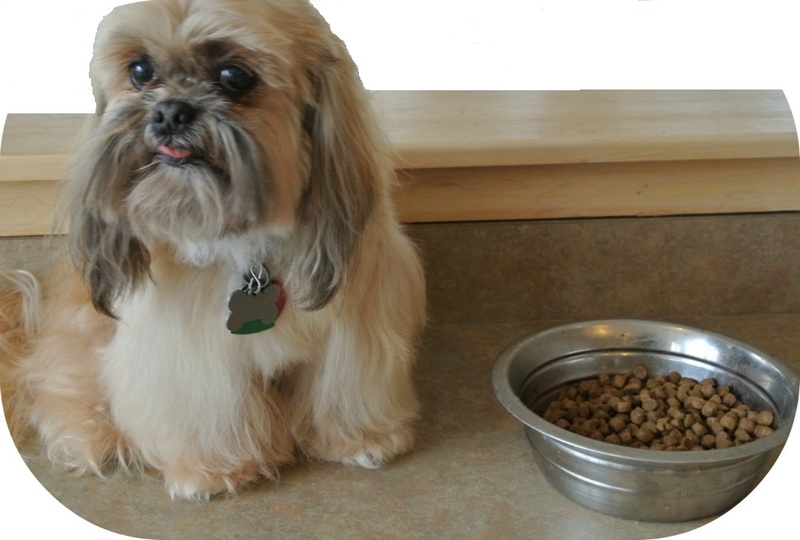 Learn about dog nutrition as it applies to small dogs.